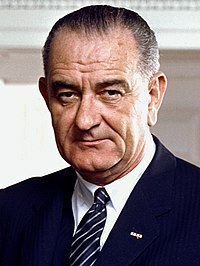 English: Lyndon Baines Johnson (August 27, 1908 – January 22, 1973), often referred to as LBJ, was an American politician, 37th Vice President of the United States, and 36th President of the United States, from the state of Texas. Slovenščina: Lyndon Baines Johnson (27. avgust 1908 - 22. januar 1973), pogosto imenovan LBJ, je bil ameriški politik in predsednik. Black and White photo portrait. President Richard M. Nixon, members of Congress, and others paying respects to President Lyndon B. Johnson at the United States Capitol Rotunda, January 1973. 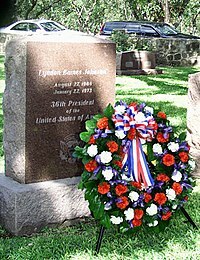 A memorial wrealth at the grave of former President Lyndon Baines Johnson on August 27, 1999.